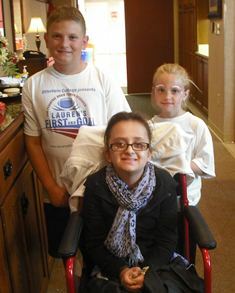 Inspired by Lauren's Circle of Strength and following the generous example set by their parents, Addison and Aiden were at it again this year in Ohio, setting up a neighborhood lemonade stand and fundraising campaign to benefit LFG. The program supported Lauren's First and Goal by hosting Patrice for an author's visit. Students had the unique opportunity to examine the LFG website after the presentation enjoying the many videos, photos and articles online. For the second time in the last few years, Muhlenberg assistant football coach and LFG camp volunteer Tom Perkovich is running the Buffalo Marathon. The 6-foot-4, 250-pound coach is dedicating his fundraising to LFG. You can learn more about it here. 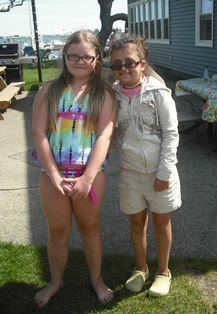 CFAC supported Lauren's First and Goal by hosting Patrice as a guest author at their first annual Literacy Luau. 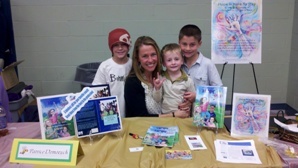 More than 1,000 children and parents came out to celebrate literacy in the community and in turn, supported LFG by purchasing copies of Hope is Here to Stay. 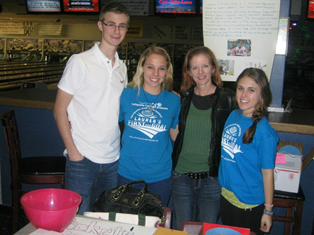 Spearheaded by senior Rachel Domozych, who has been a LFG volunteer since age 11, the National Honor Society at East Islip HS organized a bowling party to raise funds for LFG. Thanks to the participation of over 100 enthusiastic bowlers, this event raised $500 to help spread the missions of LFG. For the 8th consecutive year, students and staff donated the proceeds of the Almost Anything Goes competition to LFG. Thank you Easton Rovers for your loyal and generous support and commitment to advancing the missions of the Foundation. Neighbor and friend, Ed Adamko, once again organized his fall golf outing to benefit LFG. His group of almost 70 golfers enjoyed a stellar day on the course at the beautiful Riverview Golf Club in Forks Township, raising over $1700 for LFG. Thanks Ed...Go Giants!! 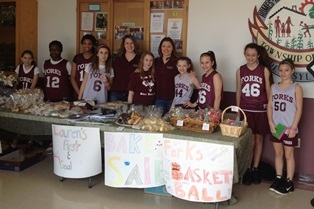 Led by the example set by their terrific coaches, Jill, Jennifer and Mike, the girls and families of the Forks Township basketball team, Forks Gold, held a bake sale at the Community Center to benefit Lauren's First and Goal, raising over $350!! Special thanks to the generous and thoughtful girls on the team, all of the bakers and to those who purchased the delicious treats during the Saturday morning and afternoon basketball games held at the Community Center. The school supported Lauren's First and Goal by hosting Patrice for an author's visit. Students were so inspired by Lauren's story, a group, led by the amazing fourth grader, Grace Stanley, were empowered to take action to help. After Friday's visit, Grace mobilized a team of refreshment stand sales groups in the neighborhood (without adult help) and by Monday the group had already raised $56 on their own. Grace proudly reported the team's success to Patrice and made sure to let her know that they were not finished yet! Kara Stetler, a recent graduate of Lafayette College - class of 2007 is currently working for the NBA in their Global Marketing Partnerships group. In her spare time she volunteers with the NBA Cares program as well as the 8th grade mentor program at Dual Language Middle School in Manhattan. Outside of NBA, she is a frequent volunteer at other organizations such as NY Cares and Jersey Cares. Because of her consistent, dedicated work within the community, she has recently been awarded as the "January Employee Community Assist Award Winner" at the NBA. Part of this award involves a $500 donation to the non-profit of her choice. She decided to donate her award to Lauren's First and Goal Foundation. Thank you Kara for all you do!! The Lafayette College Student Athlete Advisory Committee sponsored the Hope is Here to Stay 5K in the spring that raised over $2,000. Thanks to all of the tremendous athletes and the Lafayette community for their continued support. Special thanks to Mike for making the trip down from CT to be at the camp again this year. You can enjoy his beautiful photography on our web site and in the LFG Book of Drills and Skills, as well as on his professional site. Thank you Mike!! For the past three years, Paul and Dina have been making the trip out to PA from Long Island to whip up their delicious fruit smoothies and early morning coffee for players and spectators at the football camp in PA, donating a portion of their sales to the foundation. College coach and long time LFG volunteer, RJ, and his bride, Amy, celebrated their wedding in June and made a very generous donation to LFG in their guests' honor. Thank you RJ and Amy for sharing part of your special day with LFG in mind. Susan, the mom of Lafayette College player, Andrew, created and donated beautiful, handmade earrings and bracelets to be displayed and sold at the LFG camp this June to benefit the Foundation. Thank you Susan for your thoughtful and beautiful donations. Steph and Mike, loyal and long time LFG volunteers celebrated their wedding day on July 21st, making a generous donation in honor of their guests to LFG. Congratulations to the new Mr. and Mrs. St. Geramin and thank you for all you do for Lauren and our family! Led by culinary wiz, J. Andreassi, this group of dynamic and generous volunteers once again drove out to LFG from Long Island to serve up delicious sausage & pepper subs, hamburgers, hot dogs and chicken to hungry campers and guests at the camp, donating all proceeds to the foundation. Coach O'Brien gave his compliments to the chefs and seal of approval on the sausage & peppers! The school supported Lauren's First and Goal by hosting Patrice for an author's visit. For the second year, Summer & Capri, daughters of LFG Board members, John and Pamela Troxell, held their very popular and profitable Lemonade stand at a Franklin & Marshall College home football game, donating $1000 of their sales to LFG. 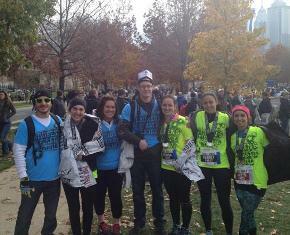 Organized by team leader Jaclyn Cirello, a group of young adults with giving and well conditioned hearts ran the Philly Half Marathon in November, raising over $2000 for LFG. Special thanks to Jaclyn, Melissa Stackpole, Dan Parrish, Melissa Chedid, Amanda Scarpa and Tierney Farry for all their efforts! New for 2012, LFG offered an online ticket auction for select college football games. Special thanks to Head Coach Bill O'Brien for donating 4 great seats to Penn State's home games and Head Coach Kyle Flood for donating tickets to Rutgers rivalry against Louisville. Other featured games included Penn State vs. Ohio State and Lafayette vs. Lehigh. In total, almost $1400 was raised through the ticket auction. We look forward to expanding the auction for 2013 and thank those who generously bid on the tickets. Staff members at Tracy Elementary, where Lauren attended school, partcipate in Dress Down Day each Friday in which each staff member donates $1. Staff members chose LFG to be the recipient of a portion of the money raised during this campaign. Thank you wonderful friends at Tracy for all your support! The class supported Lauren's First and Goal by hosting Patrice for an author's visit and purchasing copies of Hope is Here to Stay for all of their four year olds. Franklin & Marshall Head Football Coach John Troxell, who is also a founding board member of LFG, challenged his football players (some of whom are half his age!) to compete along side him in the Tough Mudder competition, a 10 mile obstacle course designed by the British Special Forces, this spring. This group of maniacs raised almost $400 for LFG.